Today was the last day at Mont Trembant. It was bitterly cold so instead of heading up the mountain for snowshoeing, we decided to grab a bite to eat and take the gondola over to the casino. We`re not big gamblers but we wanted to have a look around and maybe play a few spins of roulette. We had a great lunch at Pizzateria. 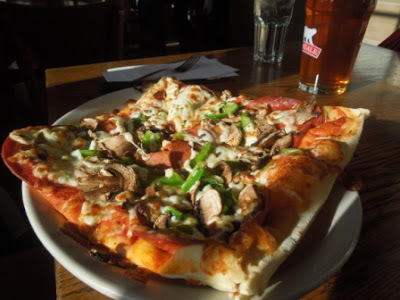 My pizza was pepperoni, mushrooms and green pepper. It was loaded! Then it was off for a ten minute gondola ride to the casino. The pictures are a little dull having to shoot through the glass but the view was incredible. The gondola is unheated and our butts were quite cold when we reached the other side. We arrived and I was surprised to find a couple of ski runs there. Perfect for afternoon skiing as there was hardly anybody on them. The casino wanted us to check our coats and knapsacks before going in. As we were packed to go home and had our laptops and Kobos in them, we decided to pass. I went up to the parking lot to take a shot of the casino, the picture at the top of this post, but on the way down slipped on the driveway, felt my left ankle twist under me as I went down, and there it was, one sprained ankle. Teena helped me up and get me back to the gondola for the ride back. Now we are back home where I am resting and icing my ankle. Look at how swollen it is. I am quite lucky that this happened just a couple hours before heading home and not on day one. Now I have visited Mont Tremblant in the summer and the winter. Both times of year are spectacular there but the buzz is much better in the winter.